The email marketing landscape has changed. 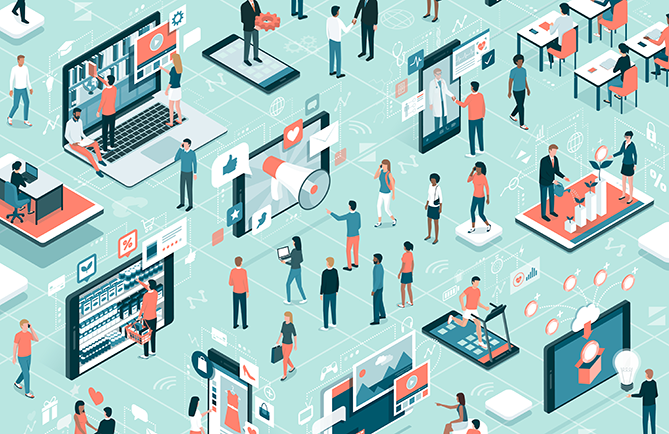 Most marketers are already on board with the importance of email marketing, and are working hard to refine the nuances of their strategy -- including figuring out what the heck the right sending frequency is for their email campaigns. 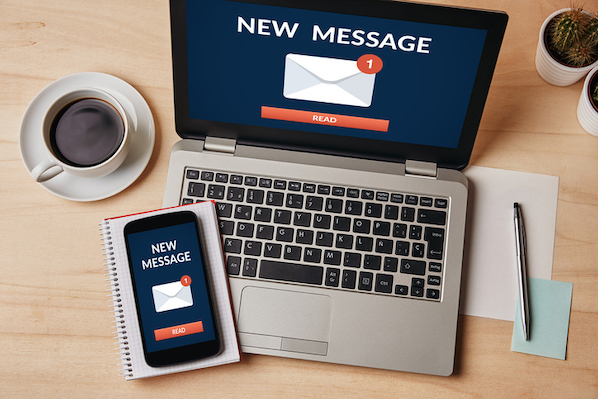 Does sending way more emails make you a spammer? 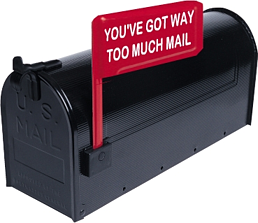 Does sending less email result in potential revenue loss? Well, it's time to analyze both sides of the email sending frequency issue further by hosting another marketing debate. And here at HubSpot, we have two employees with very opposing views on this subject. Dan Zarrella, our social media scientist and author of Heirarchy of Contagiousness, claims that sending more emails is better. 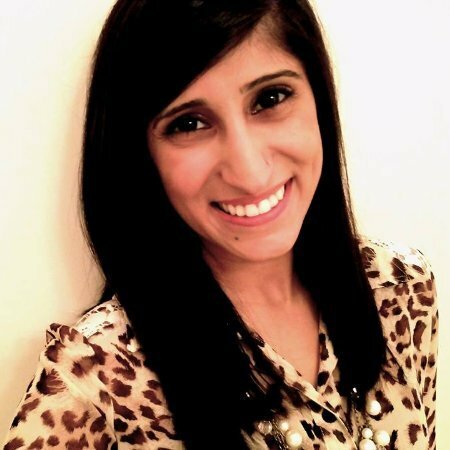 Meanwhile Sam Mallikarjunan, inbound marketing manager and co-author of an upcoming ecommerce marketing book believes excessive emailing leads to list attrition. The two of them will battle it out, defending their opinions live on air, Friday July 13th at 1PM EDT. I'll be moderating this marketing debate, pulling in your questions through Twitter via #MKTGdebate. 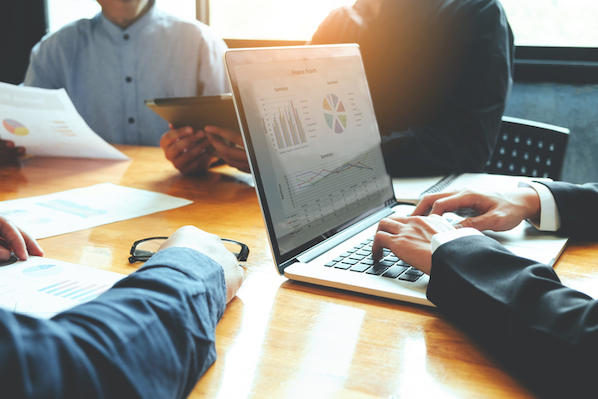 To get a little perspective before the debate takes place, let's evaluate some important email marketing statistics that will help fuel this debate. Does any of this change your opinion on ideal email sending frequency? Take a gander! 1) Emails targeted to customer loyalty programs have a 40% higher open rate. Every email marketer worth his or her salt knows that segmentation is critical to email marketing effectiveness. But this stat could contribute to both Sam and Dan's stance on the issue. How? Well, if targeted emails have a higher open rate, that should enable you to send more emails to that group as they are more receptive to your messages that contain such well-targeted content. However, this statistic could also indicate that the a high email sending frequency to an already engaged list doesn't necessarily mean you're deriving any added value from your efforts; after all, they're opening, not necessarily clicking. Plus, you should also be trying to engage the segments of your list that aren't already your cheerleaders -- those involved in a customer loyalty program aren't at a high risk of abandoning your company for a competitor. 2) More than 80% of email marketers send the same content to all subscribers. It's interesting that this statistic sprouts from the same report as the stat above. Despite the fact that targeted sends have a 40% higher open rate, 80% of marketers are still emailing the same content to all subscribers! Dan could argue that this means marketers don't even have to invest time in creating new email content since it isn't hampering open rates; but Sam might argue (again) that open rates mean nothing without clicks, and email sends to those who are already customers do nothing to help grow your new customer base. 3) 69% of U.S. email users unsubscribe from a business or non-profit email because the organization sends too many emails. This statistic clearly plays in favor of Sam's stance: sending more email leads to attrition. 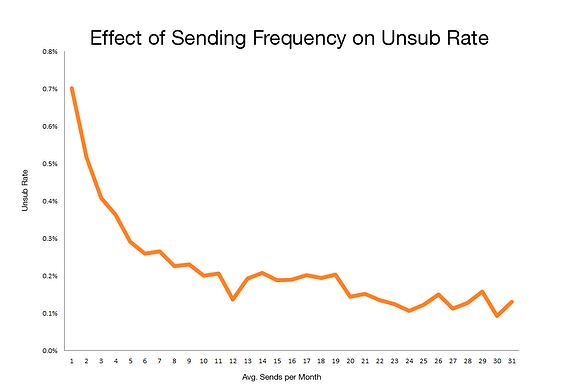 However, the following graph (compiled from MailChimp data with 9.5 billion data points), shows the effect of email sending frequency on unsubscribe rate. According to this data, the more emails you send does not correlate with higher unsubscribe rates, indicating higher email frequencies won't hurt your business. What it doesn't confirm, however, is how many of these users receiving your emails have set up filters that send your emails to SPAM. Plus, we all know that not unsubscribing does not an engaged email recipient make -- many users simply delete your message without bothering to unsubscribe. 4) 50% of consumers worldwide trust email messages from companies they have signed up to receive. If consumers trust the influx of messages sent to their inboxes -- AKA you're only emailing people who have opted in to receive email communications from you -- why should it matter how many messages they receive? But just because they trust the message doesn't necessarily mean they're not annoyed by the number of messages. If you've built a certain level of trust with your readers, why would you jeopardize that by bombarding them with everything you have to say? 5) 76.5% of commercial emails sent reached recipients' inboxes in 2011, and email blocked and flagged as SPAM increased 24%. The vast majority of emails are reaching their target destinations, so it's safe to say that if you're sending a lot of email, it's landing in inboxes. But at the same time, the number of users marking content off as SPAM is also increasing. While that number may not be as extreme as the deliverability rate, it's important to realize that recipients are marking more and more content as SPAM -- whether that means they simply are getting more comfortable doing so, or their tolerance level for a cluttered inbox is decreasing is unclear. This fact, however, should prompt you to truly evaluate how your email deliverability rates correlate with your desired email sending frequency. Whose side will you be on this Friday, and what are your opinions on email sending frequency?